The son of poor Irish peasants who had immigrated to Scotland in hopes of improving their lot, John Kane was born in 1860. At his own insistence, John went to work in the shale mines at the age of nine. The following year, Mr. Cain (as the name was then spelled) died, leaving his widow and seven children to fend for themselves. John, who had completed only the third grade, was never able to return to school full time, though he occasionally attended night classes when he did not have to work. Mrs. Cain eventually remarried, and the family began to prosper modestly. However, John's stepfather harbored a belief that they could do even better in America and went to seek his fortune there. In 1879, John joined his stepfather in Pennsylvania, and before long they had saved enough money to bring the rest of the family across the Atlantic. During the next few years, Kane roamed around the Pittsburgh area, from McKeesport to Connellsville to Braddock, and then went south to Alabama, Tennessee, and Kentucky in search of work. Buffeted from one job to the next by the vicissitudes of the economy, he helped build the Baltimore and Ohio Railroad, worked in a tubing factory, a coal mine, a steel mill, and as a construction worker and street paver. "I was always on the lookout for better jobs," he wrote. "The wages interested me the most. The amount of work, the hardness of it, the hours and all like that, didn't worry me a bit." Kane was a powerful man, able to handle the most grueling factory work and even to hold his own in the boxing ring. Kane had returned to Braddock and was living with his family when his career as a "brawnyman" came to an end. Cutting across the Baltimore and Ohio Railroad yards late one night, he and his companions were surprised by an unlit train. John pushed his cousin to safety, only to get his own leg caught on the track. Thirty-one at the time, he became a one-legged laborer with limited employment opportunities. It took him some months to recover from his accident, but he was not one to be permanently discouraged by misfortune. Balancing gracefully on his wooden prosthesis became one more skill to be mastered, and only in the last years of his life did a noticeable limp betray his handicap. Nevertheless, with his physical prowess diminished, Kane had a more difficult time finding work, and when he did finally land a job as a railroad watchman, it was at substantially reduced wages. He needed to develop abilities better suited to his new limitations, and it was thus that he became involved, bit by bit, in painting. In 1897, Kane married Maggie Halloran, and the following year their first child, Mary, was born. Family obligations made it imperative for Kane to seek a higher paying job, and so he went to work painting railroad cars for the Pressed Steel Car Company in McKees Rocks. Here he found a passion that would outlast everything else in his tenuous, tragedy-prone life. "I . . . became in love with paint," he said quite simply. At noon, while the other men were eating, Kane would slip back into the railyards and cover the sides of the bare boxcars with pictures. Much to his relief, the foreman did not object, as long as the artist's concoctions were painted over after the lunch break. From that first encounter with paint, Kane learned methods and techniques that he never abandoned. With just the three primary colors, lightened or darkened with white or black, he was able to duplicate every shade. 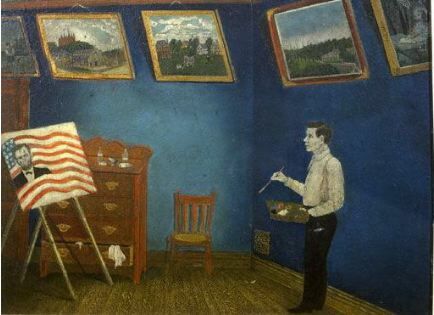 He developed a permanent disdain for pre-mixed colors and later insisted that "the best thing in the world for a young artist would be to hire himself out to a good painting contractor." When the boxcar business slackened and Kane was laid off, he decided to put his new knowledge of paint to practical use. Like the limners of yore, he went door-to-door offering to paint people's likenesses. The invention of the camera had essentially put the limners out of business, but to Kane photography was a boon. He found that his customers generally had snapshots, often of a departed relative, that they wanted enlarged and embellished. He made the enlargements himself, or had them done commercially, and then colored them in paint or pastel. Kane did well selling these photo-paintings, better, he claimed, than he did later with his larger, entirely original canvases. Kane's second daughter, Margaret, was born in 1901, but John dreamed of a son. In 1904, he got his wish, only to have it snuffed out when, a day after his birth, the infant succumbed to typhoid fever. Kane had survived economic slumps and physical injury, but this was a blow from which he never fully recovered. He began drinking heavily and temporarily lost all incentive to work. He left his family for long periods, finally losing track of them altogether. After wandering around Pennsylvania, Ohio and West Virginia for some years, Kane settled permanently in Pittsburgh. During periods of economic depression, he depended on the support of charitable organizations such as the Salvation Army. In better times, he found work as a house painter and carpenter. Throughout these long, dreary years, Kane continually tried to find a place for art in his life. Once, he attempted to apprentice himself to a muralist, who, though polite in his rejection, was undoubtedly scornful of the amateur artist's qualifications. On several occasions, Kane considered enrolling in art school, but in each instance the tuition was too high. So he worked on his own. Scraps of beaver board picked up on one of his construction jobs gave him the material on which to create some of his first independent compositions. Recalling his success with the photo-paintings, he executed unsolicited freehand "portraits" of local houses and then endeavored to sell them to the residents. As he had done all his life, he learned the secrets of his chosen craft "on the job," through trial and error. Humbly acknowledging that academically trained artists had an advantage over him, he nonetheless felt proud of his self-made accomplishments. "Often in the past I have been at a loss to know how to overcome some significant point in artistic form that I would have learned easily in an art school," he said. "But my spirit of observation has helped me to acquire knowledge and so the source of my information did not matter." In order to teach himself, Kane haunted the only halls of knowledge that were open to him: the public museums and libraries. From these sources he developed a hazy awareness of the procedures and subjects of the "fine" artist. A paucity of models must have hampered his efforts to draw from life, but he apparently got around this problem by sketching stationary figures on park benches, streetcars or in railroad stations. He also spent hours in the library copying pictures from illustrated art books. In 1925 and again in 1926, Kane submitted copies of academic religious canvases to the Carnegie International exhibition, then the most important American forum for international contemporary art. Such set pieces had been standard fare at the European salons of the preceding century, but Kane's copies did not qualify in Pittsburgh. On both occasions, his submissions were rejected: only original compositions, he was told, were allowed. On his third try in 1927, however, Kane succeeded in winning over the Carnegie jury with one of his own compositions, a painting he called Scene in the Scottish Highlands. The admission of a common house-painter and handyman to so prestigious an exhibition caused an immediate furor. Indeed, it was the first time ever that a living self-taught artist had been recognized by the American art establishment. There is little question that public recognition spurred Kane's development as an artist (as it did, sometimes with mixed results, for so many self-taught artists thereafter). Yet notoriety was hardly an unmitigated blessing. In the wake of Kane's museum debut, the press beat a path to his door in the Pittsburgh tenement district known locally as the Strip. Of course, neither these reporters nor their readers could fathom the Carnegie's selection criteria--what the public wanted was a human interest story. With their inherent flair for tragedy, the Pittsburgh tabloids turned the artist's career into a procession of small scandals. Kane's enduring poverty, the bitterest irony of his so-called success, became the subject of numerous vulgar headlines. And his death, from tuberculosis in 1934, was transformed into a garish media event, with photographers recording the final agonies of the emaciated, semi-conscious man, while writers daily debated his financial health in print. Nevertheless, though Kane reaped little tangible benefit from his late-life success, he left a powerful legacy, both in terms of his artwork and in terms of the pathway that he blazed for future self-taught artists.